As I'm sure you can guess from the pictures, I couldn't be happier with my Christmas loot. What about you? Any exciting bookish gifts under your tree? I hope you all had a fabulous Christmas. I'm going to spend the rest of my Holiday weekend doing something I haven't had the chance to do in a while: reading. Must finish all my current books so I can get started on this pile! I'm not sure if I'll get around to posting my favourite reads of the year tomorrow, but if I don't, I will on Monday for sure. Of course, this gives you an extra day to try to guess them if you're so inclined. Have a great weekend, everyone! You did indeed get books! I see Blankets and Dorothy Sayers and the L'Engle. And some awesome bookmarks, too. Wow! It looks like someone really knows how to shop for you! Enjoy! What a great selection of you haz! :D Hope you had a great day Ana, and you enjoy your reading time! Wow! You hit the jackpot! Since I'm not home, all our gifts had to be portable, so I got gift cards. Which works for me! I can't wait to go shopping! I would love to say I've been reading, but with the family and the noise, I haven't done too much of that. I did start Fingersmith and am about a quarter of the way through it! And a beautiful sight sat beneath the tree! Wouldn't be surprised if we do not hear from you for a while as you read through. :) As for me, people are afraid to give me books but I did receive The White Garden (very excited) and the complete Mastering the Art of French Cooking. Happy holidays, happy reading! Are those Madeline L'Engle's Time books I see there?!? OH what fun!! Wow! you must have been a really good girl all year long for that many books! lol.. I hope you wind up loving every single read! Oh my gosh, I'm so jealous. You got so many of the books I want. the Dorothy Sayers ones, Blankets, A Persephone (can't see what it is but it looks like a thick one), and the L'engle books. How wonderful!! Wow! 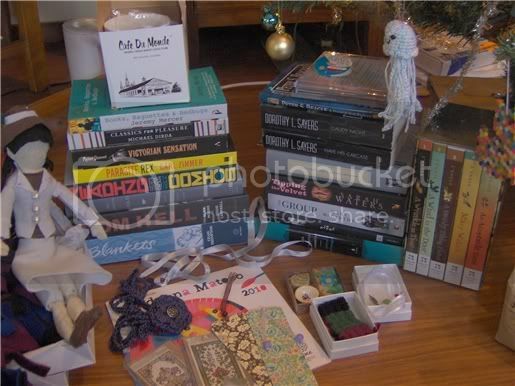 Looks like you really scored the bookish Christmas loot! I didn't do too poorly myself. I got three of the four books I asked for - I didn't ask for many because, uh, I have no idea where I'm going to put them...and the library book sale is coming up soon, too. Yikes! Anywho - I got Complications by Atul Gawande that Eva was raving about not too awful long ago, Listening is an Act of Love ed. by Dave Isay which contains the stories of average people being intereviewed by their friends or family, and (a book that requires no introduction, I believe) The Knife of Never Letting Go! Makes me glad I finished the book I was reading on Christmas Eve, so I can dig right into the sparkly new ones! What a beautiful pile of books! I see several that I already own, several I want to own, and lots of gushworthy finds. I'm very happy for you! My big gift for Christmas: A Barnes & Noble Nook e-Reader. It won't arrive until the 4th of January, and I can't wait! It must have been so much fun to open your presents! What a great collection of books! And the Cafe du Monde and Chocolate Java Drops are perfect to keep you awake to read all those books! Can't quite make out the Persephone title (although any of them would be a great gift! ), but immediately noticed The Group. That's definitely on my 2010 tbr list. Santa brought me a copy of Wolf Hall... the library copy can be returned on time!! Ana, what are the books in the box set? I can't quite read the author or the titles. You did well for books. I got 20 books for Christmas which I hope to show tomorrow or Monday. I am glad to see you had a lovely Christmas. WOW - WOW - WOW ---- what a GREAT group of books!! Santa was very good to you this year! I just finished reading Jeremy Mercer's book and plan to post the review tomorrow. I thoroughly enjoyed it. I am anxious to hear how you like all your new reads. Ooh, so many books! You really lucked out. And yay, you got FROM HELL! I can't wait to hear what you think of it. You really hit the jackpot when it came to getting books for Christmas! I hope you enjoy them all, Nymeth. Have a great weekend and enjoy your reading. Oooh, pretty! I'm particularly jealous of Parasite Rex - after reading Peeps, I really wanted to go back to the source! Awesome! I got a couple bookish gifts, The Circle of Hahn for the Vietnam challenge and a book gift certificate from Serena. WOW...Santa, sure delivered lots of books. Enjoy!! Look at all those amazing things! I'm jealous!! I love your jellyfish ornament... amazing. Happy Christmas, Nymeth! I love that L'Engle boxset - how gorgeous is that? And I'm a Dorothy Sayers fan, Altogether you have some wonderful book loot there. I've just finished Shannon Hale's The Goose Girl and loved it. And then I was giving Ursula Le Guin's Lavinia for Christmas. So I've decided to have a bit of a fantasy binge. I rarely read it, and yet now I suddenly have a real taste for it! Oh my goodness, that is a beautiful pile of loot! I see one of your trusty Santas came through and got you Blankets...YAY! You're going to love it, I just know it. :) But then it sure looks like you've one hell of a lot of lovely reading ahead of you there!!!! And your doll...she's priceless, Ana! One of these days, I'm going to get my act together enough to make a post, and when I do, I'll show a picture of my gorgeous Jason creation, Calpurnia. She's positively beautiful, too! We sure have some very talented, incredibly giving friends, don't we? I'm still not quite sure that I deserve you all! You must be dancing! Looks like you got a lot of great new reads. I'm happy for you. Enjoy. Wow, you sure got an awesome number of books there! :-) Enjoy them! What a lovely pile of books! I did indeed receive some book related gifts for the holidays including my very own copy of The Graveyard Book and a lovely gift certificate at my local independent bookstore. Happy Holidays, Nymeth! Wow! That's a lot of books. No one in my life buys me books. I did get a $40 book voucher so I will be able to buy probably one book and contribute towards another. Will have to think about what books to get. Oooh, great books! I like the one about Shakespeare & Co. (Books & Bedbugs...), and I hope you'll love the L'Engle (and everything else)! Believe it or not, I got no new books for Christmas. I think everyone knows it's the last thing I need! I did get three fun old cookbooks, though, from my mother-in-law. Happy holidays! Wow! You know you are loved! Happy reading! We have matching Octopi! ;) Ohhh-I'm most excited about the Dayser and Waters for you. :D But they all look like wonderful fun! That boxed set of A Wrinkle in Time is SO pretty. Merry Christmas Ana! What fun!! And Cafe du Monde as well! Hope you have a wonderful reading year ahead of you! Oddly, my family never buys me books for Christmas. They say "but you have books." They also say "but we don't know what you already have!" To which I think "gift card." I always get wonderful gifts anyways. I just think it is odd the inner workings of non-bookish folk. Wowza!!!! You got a great stack of books! Yippee...Merry Christmas! Yay you got the L'Engle books! I am looking forward to our read-along. I must write a post about that! No one ever buys me books, so enjoy! I think that's the best picture of a successful Christmas that I've seen yet! It looks like you'll be quite busy for awhile and I'm jealous - I got no new books this year - I think it was a conspiracy because I have way too many books in my home. And the L'Engle books are divine. Fantastic book haul. I got a Sony ereader pocket so i can read my e-arcs more readily. It's shiny and pretty and has books so I am delighted, although nothing is the same as the sheer pleasure of a real book. Hurrah for the Sayers and the lovely L'Engle box set (I'm a sucker for box sets of things)! And I see Victorian Sensation there as well - I own that too and I really don't know why I've never got round to reading it. Man, I'm so jealous at your loot! You've the set of Time books by L'Engle! Double-jealous! LOL. I haven't heard of the other titles before (well, I do now) and they sure look interesting. :D Enjoy reading your fantastic new books! Merry Christmas and a Happy New Reading Year! New Year's resolution: get back on track with replying to comments. I promise it's not because I don't care, though! Thank you all for the kind words and holidays wishes. I really do appreciate them! Wow someone really racked up the goodies this year! I need to go spend my book gift cards soon. Glad you had a nice Christmas Nymeth :) wow, Great books!!! I didn't get any book-ish gifts, believe it or not. But your stash looks pretty awesome! Oh wow!!! Such wonderful wonderful things!! I haz an octopus/jellyfish thing too :D Isn't it the cutest damn thing?? You did awesome this year Ana!!! What a great selection of gifts-what are in the little boxes. Oooh, Carl Zimmer... I'm very excited to see what you think of that one. I haven't read anything by him but his blog, but he's on my list for the new year. I got... FOUR books (that may be a Christmas low). One was a cookbook and another a coffeetable book; then The Cellist of Sarajevo and Write Away. All of which are lovely. Apparently people have decided that since I am a librarian I don't really need to own books now, though! 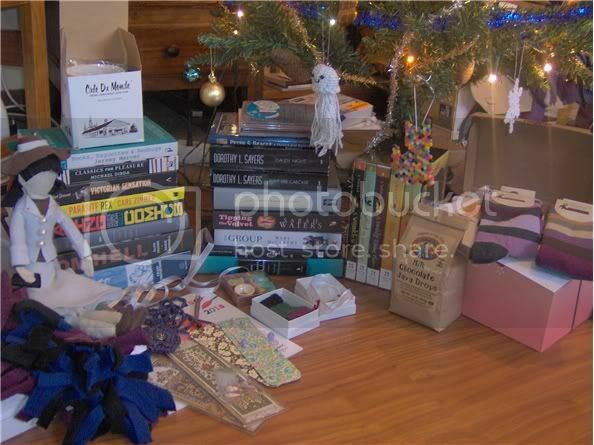 It looks like you had an amazing Christmas what with all the bookish goodness in that pile! I hope you enjoy every last one of them!